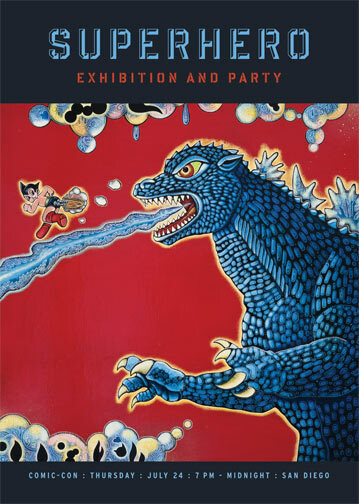 You, your super friends, and even your arch-villains are all invited to attend the “SuperHero” Exhibit! Party along with us during San Diego’s International ComicCon! Live music [The Modlins], DJs [SSI], and great finger foods and sushi will be featured along with Effen Vodka drinks, spicy house guests, and overall good times. When is this you ask? Thursday, July 24, 7 P.M. to Midnight. This is a great way to start off the ComicCon for what is certain to be a super weekend of art, movies, Godzilla, costumes, gaming, amine, and even more parties. “SuperHero” is a celebration of the popular arts, great friends, and creative opportunities, brought to you by your pals here at Ninthlink and Murphy Design. Numerous artists who have traveled from around the globe to attend the ComicCon will be in the spotlight at “SuperHero,” along with many, many fans of pop art and culture. Featured artworks will celebrate the theme of the “SuperHero.” Attending guests may commemorate the theme in costume if they wish. We’d love to see what superhero and popular character costumes and outfits you have! Where is this happening, you ask? Only one mile away from the San Diego Convention Center, at the Warehouse Space located at 1616 National Avenue, San Diego 92113. There is no cost for this event—yes, that means FREE! Cash bars will be available. of spirits during this event. Anthony Lister + Jeff Soto + Joel Nakamura + Jen Lobo + Matt Stallings + Luke Chueh + Mark Todd + Esther Pearl Watson + Martha Rich + R.G. + Peter Taylor (Handmade Feet) + Andy Howell + Kathie Olivas + Chris Ryniak + Lola + Germs + Marco Wagner + Mark Murphy and many more. All artwork is available for acquisition! Previous PostJoin Us To "Think Green" With Our New Office Bicycle Space! Next PostDarn You, You Log-ins, You! Sorry can’t make it. My g*friends bday that night. Damn. Who did the godzilla piece! I love it! you will be missed. rock out. tell your lady happy bday!